My reader thought that this could be mapped onto the work/play schematic & I think it can, with the caveat that this is about just the part of a person's life that's about getting paid. Which is a pretty big part of everybody's life, but hopefully not anybody's whole life. Whereas businesses presumably primarily exist to get paid. 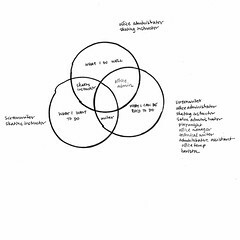 So this diagram is about the three-fourths of your life that involves work —work that is work, work that is play, play that is work— and leaves alone the one fourth that is play that is play, which I'm protective about. Life is a lot of getting paid and a lot of work —and obviously, there's a relationship between work and getting paid— but there has to be some part of life, however small, that's no work at all. Work is what again, something that is done as a means to an end & in this case, getting paid is the end; and play is something that is done as an end in itself. So, LEARN TO SAY NO is for work that is work. I guess I'm also protective about work that is work! Like play that is play, it's probably good for you in small amounts & it's probably best to be able to work when it's called for. You want this to be minimized, but not eliminated. 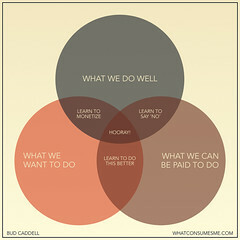 LEARN TO DO BETTER is for work that is play. Because you're doing it as a means to an end, but not achieving your end. I mean, it's good that you like doing it anyway. But. Is that what you really want? Don't you want to get what you want? LEARN TO MONETIZE is for play that is work. Because you're doing it as an end in itself, and it's being a means to an end all on its own. Bonus, but be bold and maybe mighty forces will come to your aid! ...where either work that is play or play that is work could move into the hooray spot. I suppose it depends if you think it's more likely that you can figure out how to get better or figure out how to get paid. I drew up a little diagram for myself, which if I were really ambitious I would have rendered as three interlocking drink rings on a cocktail napkin; pretend I did that, too. * office administrator, which I do well & that I can get paid for, but don't want to do. As far as office administrator jobs go, I like my job & wouldn't leave for any other office administrator job. Or any other job except the following, if they actually paid at all or enough. Which they don't, and I have to eat. * screenwriter, which I can be paid for & that I want to do, but don't do well (enough). Which I don't do enough, full stop. I can do better. I'm thinking on these things.